Avalanche are a substantial potential threat to climbers year round. Every year, dozens of individuals are killed during avalanches because they were unequipped, did not recognize the danger signs or pushed too hard. Be prepared and you can remain safe while enjoying your climb. 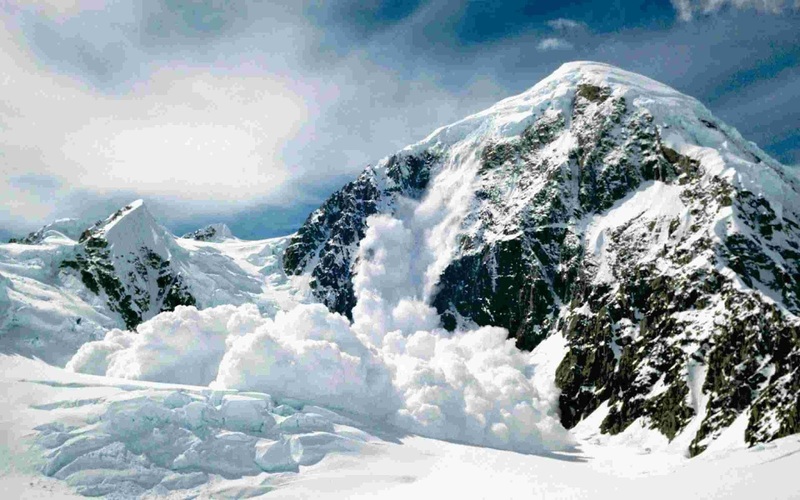 The two primary kinds of avalanches that occur in snow are point release and slab avalanches. Each has different characteristics and warning signs. » Point Release:When a single rock or snowball comes loose and the effect slowly grows larger, this is a point release avalanche. These are the less dangerous of the two kinds of avalanche as they are generally shallow and will usually only knock or push you to the ground. They can, however, be dangerous if you are climbing a Cliffside and are pushed free. » Slab Avalanche:A slab avalanche is when massive plates and chunks of ice and snow break loose and start to fall. Because of the larger scale, these avalanches are much more dangerous. When the weakened layer of snow collapses, the snow on top breaks up and starts to slide as well. A slab avalanche will vary greatly in size, from a point release sized slide to a massive flurry that can bury a house. Class One : The equivalent of a point release. Will knock people over, but not deep enough to bury anything. Class Two : Deep enough to bury a person. Class Three : Deep enough to bury a car. Class Four : Deep enough to bury a house. Class Five : Deep enough to bury multiple houses catastrophic avalanche. The danger of an avalanche is established when three points are present. These three points are considered the avalanche triangle and should keep climbers home or at their base. 1. Terrain: There are certain areas that are more prone to avalanches. This avalanche terrain is often quite obvious as there will be few if any trees present and an angle of more than thirty degrees to the slope. Anything less than thirty degrees is usually to gentle of a slope for severe avalanches. Avalanches are still possible at small and large angles though. You may be on a run out area, accounting for a twenty degree slope. Alternately, though forty five degrees and higher is usually safe because snow will slide down naturally as it lands, there are certain circumstances in which avalanches are still possible at this angle. 2. Unstable Snow : The stability of the snow is one of the primary points of hazard for an avalanche. If it shifts readily under your feet, looks as though it has not moved in days or weeks, and no animals are present, the snow is likely very unstable, marking the area as a high danger zone for avalanches. 3. People When there are people present, there is a danger of being caught up in an avalanche. If they are not present, an avalanche is nothing more than a beautiful act of nature. If you notice unstable snow in avalanche terrain, steer yourself and any other people away to remain safe. There are many things you can do to avoid being caught up in an avalanche when you go climbing, skiing or snowboarding. The first thing is to know what you are looking for. By acknowledging and steering clear of potential danger points, you can keep yourself and your friends safe from the imminent bodily harm the mountain might inflict.